Its title is My Book of Bible Stories. Its hard cover is gold in color, and the letters of its title are indented. They are shining red letters, giving the appearance of golden red. It is attractive and appealing to the eye. The book was copyrighted in 1978. A notation on the flyleaf says: “This Book Is Published in 93 lan- guages” and “Total Books Printed of All Editions: 38,300,000 Copies.” The book is divided into eight parts and claims to tell 116 Bible stories for children. The stories are illustrated with colorful pictures, either one or two at nearly every opening. The copy I am holding was given by a woman, who is obviously sincere and honest, to our daughter as a gift for her little boy. Though beautiful in appearance and represented as a wonderful book to read to little children and to be read by older children, it’s an insidious piece of poison. It was put out by the Watchtower Bible and Tract Society of Pennsylvania. 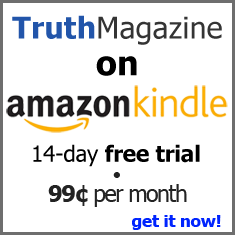 The publishers are the Watchtower Bible and Tract Society of New York, Inc., International Bible Students Association, Brooklyn, New York, U.S.A. And you, our readers, should ­know that these are the people who call themselves by the misnomer, “Jehovah’s Witnesses,” a name arbitrarily given them by judge J.F. Rutherford back in 1931. It came from a misapplication of Isaiah 43:10 and 44:8 which were spoken by Isaiah, from God, of ancient Israel (see 43:1, 3 and 44:1; read all of chapters 43, 44, and 45 in which the restoration of God’s people Israel from the Babylonian captivity and under Cyrus, king of Persia, is foretold and depicted). What Rutherford’s disciples go about doing from door to door does not fit the meaning of “witnesses,” and what they teach did not originate with nor honor Jehovah. The very first story of the book is titled, “God Begins to Make Things.” After telling the reader that before God made the sun, the moon, the stars, and the earth, he made the angels, the book then says: “The first angel God made was very special. He was God’s first Son, and he worked with his Father. He helped God to make all other things. He helped God to make the sun, the moon, the stars, and also our earth.” Thus they seek to indoctrinate little children with their God-dishonoring doctrine that denies the eternalness and deity of Jesus Christ. They teach that the eternal Son of God, our Savior, had a beginning, that he was an angel, the first angel that God created, a created divine being, “a God.” Colossians 1:15-17 is listed, along with Jeremiah 10:12 and Genesis 1:1-10, at the end of the story. Because Colossians 1:15 refers to Jesus as “the firstborn of all creation,” they teach that he was both created and the first thing that God created. The passage rather shows his preeminence in regard to the creation. “Who is the image of the invisible God, the firstborn of all creation” is followed immediately by: “for (which indicates an explanation of the last statement, bc) in him were all things created (emphasis mine, bc) in the heavens and upon the earth, things visible and things invisible, whether thrones or dominions or principalities or powers; all things (all created things, bc) have been created through him, and unto him; and he is before all things (all created things, bc), and in him all things (all created things, bc) consist.” “The Son of his love” (v. 13) obviously was not a part of the created things. They also appeal to Revelation 3:14, which refers to Christ as “the beginning of the creation of God.” They say that this means that Christ was the first thing created; however, Bible-language scholars insist that it means “the beginner or cause of the creation.” This is in harmony with the context of Colossians 1:15-17 and other Bible passages. John 1:1-3 reads: “In the beginning was the Word, and the Word was with God, and the Word was God (this affirms his deity and his equality with the Father. Their New World Translation mistranslates: “and the word was a God,” bc). “The Same was in the beginning with God. All things were made through him; and without him was not anything made that hath been made.” Christ was not one of the “made” things; Christ was not one of the “created” things. He was, rather, the One through whom and by whom all things were made or created. Micah 5:2 (correctly cited by “the chief priests and scribes of the people” to identify for Herod the Great the place where the Christ was to be born, that is, Bethlehem) says of the Christ, “that is to be ruler in Israel; whose goings are from of old, from everlasting.” Far, from being created, he had always existed. No wonder he is called “the image of the invisible God” (Col. 1:15) and “the effulgence of his glory, and the very image of his substance” (Heb.1:5). Far from being created, Christ created all things that were created, upholds all things that were created, and is heir of all created things. Jehovah’s Witnesses, using Revelation, chapters 7 and 14, entirely out of context and in diametrical opposition to many Bible passages, teach that exactly 144,000 people will live forever in heaven with God. All of the rest of the people who meet with his approval, they will live forever upon this physical earth after it has been renewed and made perfect as it was in its original state (remember, they call this “the grand hope”). In the Bible we are told that there is “one hope,” just as there is “one God and Father,” “one Lord” (our Lord Jesus Christ), “one Spirit” (the Holy Spirit), “one faith” (the faith of the gospel), “one baptism” (baptism in water in obedience to Christ), and “one body” (the spiritual body of Christ, his church). See Ephesians 4:1-6. This one hope is “laid up for you in the heavens” (Col. 1:5; 1 Pet. 1:3-4). They have two hopes: one for the 144,000 and another, which they call “the grand hope,” for the rest of God’s people. What will happen to the physical heavens and earth according to the Scriptures? 2 Peter 3 gives an emphatic answer to that question. Read verses 3 and 10-12. They will be no more; they will cease to exist. The pretty yellow and red book of Bible stories for children declares this doctrine of their hope of living for ever on this renewed and perfect physical earth again and again in its various stories of the Bible. What a pity that so many have been produced and will have their effect in leading little children astray.